General Motors announced that Dan Akerson, who guided today's GM to record profits and dramatic improvement in vehicle quality while closing the chapter on government ownership in the company, will step down as Chairman and CEO on January 15, 2014. 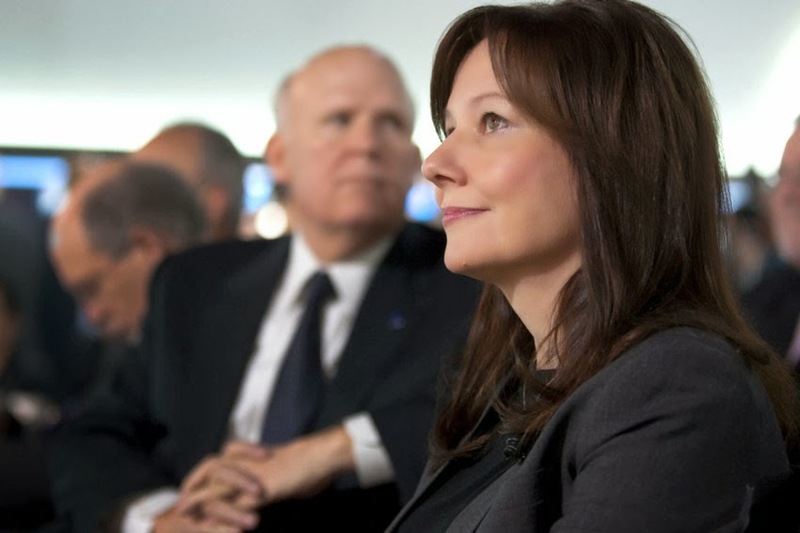 Mary Barra, 51, Executive Vice-President, Global Product Development, Purchasing and Supply Chain, was elected by the Board of Directors to become the next CEO of the company. Barra will also join the GM Board. Akerson, 65, pulled ahead his succession plan by several months after his wife was recently diagnosed with an advanced stage of cancer. The Board also named Theodore (Tim) Solso to succeed Akerson as Chairman. Solso, 66, is the former Chairman and CEO of Cummins, Inc., and has been a member of the GM Board since June 2012. With 33 years of experience at GM, Barra has risen through a series of manufacturing, engineering, and senior staff positions. She is a leader in the company's ongoing turnaround, revitalizing GM's product development process resulting in the launch of critically acclaimed new products while delivering record product quality ratings and higher customer satisfaction. "With an amazing portfolio of cars and trucks and the strongest financial performance in our recent history, this is an exciting time at today's GM," said Barra. "I'm honored to lead the best team in the business and to keep our momentum at full speed." Dan Ammann, 41, Executive Vice-President and Chief Financial Officer, was named company President and will assume responsibility for managing the company's regional operations around the world. The global Chevrolet and Cadillac brand organizations and GM Financial will also report to Ammann. Ammann joined GM in 2010 where his first assignment was to manage GM's initial public offering. As CFO, he has led a transformation of GM's finance operations into a world-class organization. He also led the strategy to rebuild the company's captive finance capability through the successful establishment and growth of GM Financial. "We have a significant opportunity to further integrate and optimize our operations to deliver even better results," said Ammann. "While we have made good progress, we still have much work ahead of us to realize GM's full potential." Ammann will retain CFO responsibilities at least through the release of the company's fourth quarter and full-year 2013 results in early February 2014. His replacement as CFO will be named later. Mark Reuss, 50, Executive Vice-President and President, North America, will replace Barra as Executive Vice-President, Global Product Development, Purchasing and Supply Chain. Under Reuss' watch, GM's North America region has produced consistent profits and improved margins during a product renaissance that includes the launch of award-winning cars and trucks such as the Cadillac ATS, Chevrolet Corvette, Impala and Silverado pickup. Alan Batey, Currently Senior Vice-President, Global Chevrolet and US Sales and Marketing, will replace Reuss and is named Executive Vice-President and President, North America. Batey, 50, joined GM's Vauxhall operation in 1979 and held several sales, service and marketing positions around the world. "North America is the foundation of the GM turnaround story and I'm honored to help continue what Mark started," said Batey. "We remain committed to delivering the world’s best retail experience to match the world’s best cars and trucks." The company also announced that Steve Girsky, 51, Vice-Chairman, Corporate Strategy, Business Development and Global Product Planning, will move to a senior advisor role until leaving the company in April 2014. He will remain on the GM Board of Directors.